Welcome to the website of Patrick Manintveld Dressage Stables. Patrick Manintveld’s Dressage Stables is located in Belgium, 40 km from Antwerp, and …km south of the border with the Netherlands. 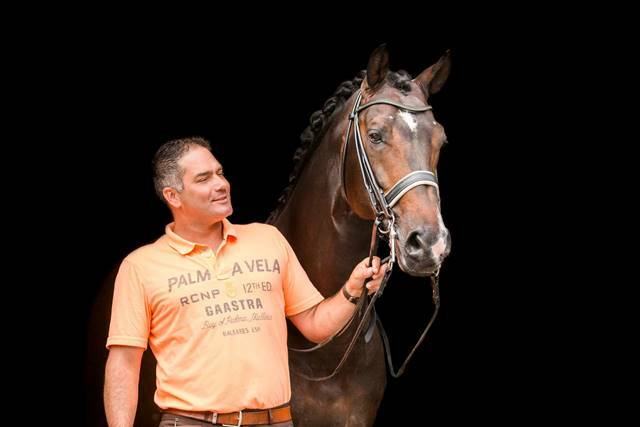 Patrick Manintveld’s Dressage Stables specialises in breeding, breaking-in, training, and sales of dressage horses. Patrick also gives instruction and clinics in dressage riding. The equestrian facility is equipped with all facilities to aid the development of both horse and rider. The horses offered for sale by Patrick Manintveld Dressage Stables have all been vetted so that you are not confronted with unpleasant surprises once you have reached a decision about your purchase. Patrick is pleased to offer this service, in addition to training the horses, giving instruction and judging at competitions. At all times, the health and welfare of the horses are the main priorities at Patrick Manintveld Dressage Stables. The horses are ridden according to their training level, or go in the walker. They are put out in a field daily and can be walked by hand or grazed. Patrick Manintveld Dressage Stables has good references for various veterinarians, and your horse can also be stables for a rehabilitation program. The best care is provided, and the health and progress of your horse are followed on a daily basis. If you are interested in discussing any of the above-mentioned possibilities, please send a email to info@patrickmanintveld.com. We will contact you as soon as possible to make an appointment.